FACT CHECK: Did a Football Fan Sit on an American Flag While Wearing a Shirt Reading 'I Stand for the National Anthem'? 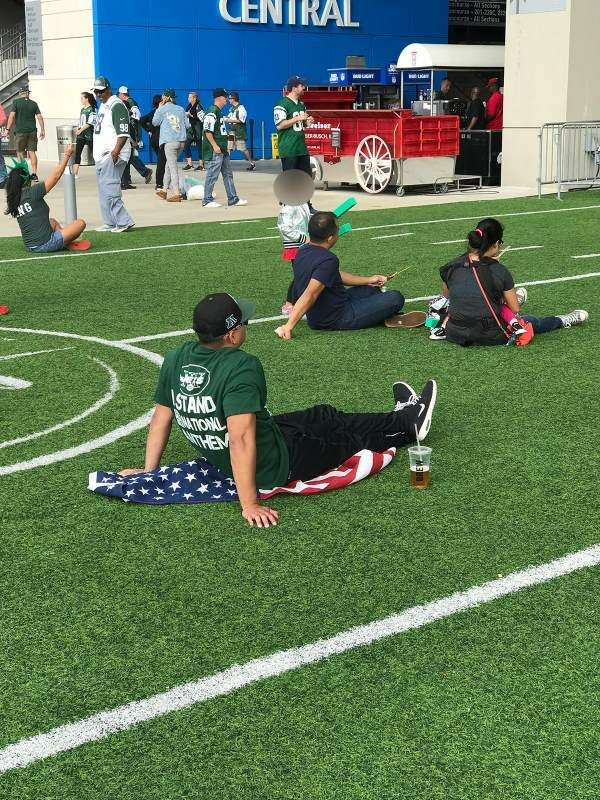 Did a Football Fan Sit on an American Flag While Wearing a Shirt Reading ‘I Stand for the National Anthem’? A sports news web site published the photograph, which was taken during a game between the New York Jets and the New England Patriots. A pro football fan sat on the United States flag while wearing a shirt that read: "I stand for the national anthem." While President Donald Trump has argued that player protests against extrajudicial police killings show disrespect for the U.S. flag, a photograph published by the sports news web site Deadspin on 16 October 2017 shows at least one pro football fan visibly tarnishing the flag. The image shows an unidentified man wearing a t-shirt bearing the phrase, “I STAND FOR THE NATIONAL ANTHEM” under the logo for the New York Jets. The statement is a rebuke to the kneeling demonstrations that originated with former San Francisco quarterback Colin Kaepernick prior to the 2016 season, who began to kneel during the national anthem in order to bring attention to and protest police brutality. I put the picture in reverse Google image search and I didn’t find anything. I went and looked at the metadata of the photo and it was taken on October 15th, which would have been Sunday and taken at 3:18 p.m. That would’ve been during the game. While Kaepernick has not been signed by a team during the 2017 regular season, other teams have carried out their own demonstrations during the anthem. Instead of kneeling, however, the Jets — whose owner, Woody Johnson, was appointed by the president to be the U.S. ambassador to the United Kingdom — have opted to stand with their arms linked. They did so again before the game against the Patriots. CBS News. 23 September 2017. Sports Illustrated. 24 September 2017.